What Do “Pit Bulls” and Unicorns Have In Common? We know this is going to be a controversial and emotional podcast episode, as so many people are attached to the term. It was an emotional topic for us to discuss, too. Nicole has always felt that while it makes sense for scientists, journalists and animal welfare workers to be completely accurate in how they talk about dogs, individual dog owners should be able to call their dogs whatever they want – even if that term doesn’t refer to anything that has a solid definition and, in fact, refers to something that doesn’t actually exist. And if you’re thinking “But what about American pit bull terriers! ?” don’t worry, we cover that. But to get to the point, very few people use it to refer to a specific breed. It may have had that meaning once but the term has been diluted and no longer has any real meaning. Janis Bradley, Director of Communications and Publishing for the National Canine Research Council, the term is just as relevant as calling a dog a unicorn. She steps in to discuss the damage the inaccurate label of “pit bull” can cause to dogs and their owners. And, most importantly, she explains why it’s an empty term with no real definition – which is what makes it dangerous. It has no definition, but it has a whole lot of stereotypes associated with it – both negative and positive. Yes, there are positive stereotypes associated with the term, but they’re just that, stereotypes and stereotypes of any kind don’t do anyone any favors. Remember, it’s not a term of endearment for everyone who uses it. The use of this non-defined label, even in our own homes, creates the perfect conditions for scapegoating. Because there is no definition and no standard, because “pit bulls” don’t actually exist, we can apply the label to any dog – effectively labeling that dog a “villain” in our collective unconscious because the label is so loaded with negativity. We don’t realize it, but when we use the term we are enforcing one of the very things we know to be false – that any dog with this label is dangerous. But what about other dogs who deal with negative stereotypes like Dobermans or German shepherds? Janis makes the point that because these dogs are actual breeds with a clear definition, they aren’t subject to the arbitrary labeling that perpetuates negativity. Everything goes back to accuracy and how inaccuracy can have devastating consequences. We know this topic is going to bring up a lot of emotions and maybe even anger. We just ask that you think about the things we talk about here and also ask yourselves why you are so tied to a term that doesn’t really mean anything at all. Nikki: Hey everybody! Welcome to the Individual Animal, a podcast about animal welfare and discrimination. Regina: (laughs) You don’t sound too sure. Nikki: Regina usually says that part. That was right, right? Regina: That was correct, yeah. This is a sensitive subject, I think. I think this topic is going to be sensitive for a lot of people because we talk about something people really cling to and that is the label “pit bull.” People cling to it a lot. And there are all kinds of emotional reasons and we do touch on that a little bit. But, I think we’re gonna have some angry and confused people probably when they’re done with this podcast and I think that’s OK.
Nikki: Yeah I think that’s how people change. When we first decided to do this topic and Janis sent over her notes, I got a little emotional. I had a conversation with you about it. You know I was talking about how I sort of cling to labels sometimes, too. I wish I wouldn’t. So, I don’t know if people are going to be upset as much as they’re going to be like wanting to know more and wanting to figure it out a little bit more. Regina: And it’s a habit it’s hard to break habits. And we talk about that a lot. That language is habit. And that’s that’s the case here with the term “pit bull” or just the need to define our dogs in general. And that goes for anybody with any kind of dog. Nikki: So, our guest today is Janis Bradley who is the Director of Communications and Publications for the National Canine Research Council. And she’s going to be talking about “pit bulls” and how they are very similar to unicorns. So I hope you’ll like it. Let’s get into the show… what did you want to say? Regina: Oh yes just that National Canine is a subsidiary of Animal Farm Foundation, just wanted to put that disclaimer out there. Nikki: I think this recording comes at a good time. I am talking about removing breed labels on Friday and Southeast Conference in Georgia. And all time I get from people listening to the presentation, “well, I know what a “pit bull” is. I can tell you by its characteristics.” So, Janis can you tell me a little bit about the best way to go about how to answer that question. Janis: I certainly hear that all the time. I hear that kind of comment. You know, “I know one when I see one” all the time. Then people may try and persuade me to talk about the characteristics of “pit bulls.” I have to confess that when that happens, I am more than tempted to respond with something like, “OK yes. Right after that we can have a nice scientific discussion about the characteristics of unicorns.” And then kind of wait for the expression on the person’s face that tells me that they are visualizing me with a with a horn in the middle of my forehead. I know that sounds facetious, but the analogy is actually a pretty decent one between unicorns and “pit bulls” in quotation marks. The biggest difference really is in the real world effect. Because, if you think you can seriously talk about unicorns you’re just making yourself look foolish and ignorant. But, if when we start to discuss “pit bulls” as if they existed, we do harm to dogs and to the people that care about them. So it matters. Nikki: But… are you saying that there is no dog breed? Janis: Oh no. There’s there’s certainly such a thing as a dog breed and it’s a very specific thing has been for the last at least 150 years. A dog breed is a group of dogs that are all members of a closed gene pool. And that’s just a fancy way of saying there’s no cross-breeding allowed with dogs that aren’t members of that breed. And so, then each of these groups is designated by a particular name according to one of the major breed registration organizations. There are a couple of great big organizations. But, there is no such group that is called “pit bulls” there. Regina: OK so one thing… I’m going to interrupt you. One thing that I see a lot online is, you know, people say “oh a pit bull is only an American Pit Bull Terrier.” So what do we say to those people? Janis: You can say that there is a breed called an American Pit Bull Terrier, often called APBT for short. It’s a breed that’s recognized only by the umbrella organization called the United Kennel Club. And the United Kennel Club doesn’t require the same documentation of a long-term closed group pedigree, as do the the larger the breed clubs that are recognized by the two big registration organizations. So, to be recognized as a breed by the UK city is a bit looser than then to be recognized by say the American Kennel Club, which is the big organization in the United States or the… Oh boy… can’t pronounce this…. Fédération Cynologique Internationale. I apologize to any French speakers here! I know that’s just ghastly! I just think of it as FCI, which is the big group of breed clubs in Europe. But, the other difficulty, even with American Pit Bull Terrier, is that none of the companies or the researchers who have developed DNA profiles for specific breeds… you know those are those people you can you can send up a cheek swab you know to and then they’ll come back with a whip with a breed identification, none of them have DNA profile for APBT. So. the registration documentation is a bit loose and there is no DNA documentation. But it’s reasonable to be generous and agree to call a UKC pedigreed American Pit Bull Terrier a member of a breed. Let’s say we grant that, although you know again somewhat loosely defined. So if you say that your dog is registered with the UKC as an American Pit Bull Terrier, you’re talking about something that does exist. That’s real. However, this is not often what people mean when they refer to “pit bulls” and certainly not when they talk about “pit bull type” or “pit bull” groups. Usually people mean something much broader than dog registered as an APBT with the UKC, but it’s an actual thing it’s not a fantasy as are the rest of the [identifications]. Nikki: Yeah, I would say for shelters that most of the time they’re not referring to an American Staffordshire Terrier or an American Pit Bull Terrier when they’re slapping that label “pit bull” or “pit bull” mix on a dog in a shelter. Janis: Yeah, they tend to be referring to something, you know, sort of more general and vague. But, again, there is such a thing as an American Staffordshire Terrier. But, if that’s what you mean, that’s what you should say. That is in fact a breed. And then say, if you say you know this dog is an American Staffordshire Terrier, that’s a label that can be verified or it can be disproved either by reference to a pedigree or through DNA testing. But to call that same dog something else, like “pit bull” is a little bit like saying my dog is a water dog when when somebody asks you what the breed of your dog is, and expecting the person you’re talking to, even if that’s a knowledgeable person, to actually decode that what you mean is your dog’s a Labrador retriever. And so, that kind of relationship… that the two things just don’t mean the same thing. Janis: No. I mean the simple answer is no. They’re just there just is no such thing. The AKC for example divides breeds up into groups but none of those is the pit bull group. There’s a hound group. There’s a terrier group. There’s a working group. There’s a herding group. There’s a sporting group. There’s a non sporting group. There’s a toy group and There’s what’s called a miscellaneous class, which is breeds that haven’t quite reached full status in the organization yet. So, grouping various breeds together under this label “pit bull” is an idea that was mostly concocted by lawyers and legislators – obviously, not dog experts. And which came out of kind of old casual folklore ways of referring to any dogs that were forced to participate in dog-fighting. It has nothing to do with canine genetics or breeding practices. So you’ve got these made up groupings that vary, and according to which legislators or lawyers are talking about it, they vary and they often include breeds that are actually plucked out of several different AKC groups. So you might have a couple at so many you know one of the definitions might say that that a pit bull is one of these terriers or a dog from some from the working dog line or some from the non-sporting dog groups. So you wind up with a kind of a conflation of breeds that aren’t even consistently closely related according to what we now know about the DNA documented family tree of dog breed. We now have quite good kind of family trees that show how closely related various dog breeds are. And often these these arbitrary groupings are plucked from all over the place. So this this “pit bull” type designation of dog breeds is really about as closely tied to reality as I hate to belabor this as the Unicorn Group is did is to equine breeds. So using the term “pit bull,” it really creates the same kind of confusion as when you identify your dog’s breed to your friend as a water dog. I made that up by the way just in the interest of full disclosure there’s there’s there’s there’s equally no such thing as a water dog. But, if you say this, your friend doesn’t know any more than you did before you might mean Portuguese Water Dog or Irish Water Spaniel or American Water Spaniel. Those are all real breeds that have water in the name… or maybe you mean breeds with a reputation for liking to jump in the water that might include many of the dogs with retriever in the name, who are from those who are from the sporting group… or perhaps a Newfoundland or Landseer from the working group then because those are breeds that are famous for rescuing drowning people… or maybe it’s just your casual way of referring to to your dog as one who likes to swim. And of course, you know that that could be pretty much any breed. You haven’t really told the person anything. Exactly the same situation with saying that this is a member of the “pit bull” type dog. You haven’t said anything. Regina: You know, this made me think I’m trying to do a real world example and of course talk about my dog which I do as much as I can but I don’t tell people. Well he’s a Spitz. Like that’s the class of dog that the AKC has thrown his breed into. But I don’t. When people ask me I don’t say he’s a Spitz. So then why would anybody say “my dog’s a pit bull”? It’s interesting how they’ll try to use that fake classification when nobody else does that for their dogs really. Janis: Yeah, I mean people don’t even use the real classifications when they’re when when they’re talking about their dogs, so it makes even less sense to use, you know, a made up one. One of the claims, and one’s that that’s that’s commonly used here, is let’s say OK. “Well then, I’ll call them bully breeds.” Again, exactly the same problem. Who’s the “them” you’re talking about. There’s no definition. Nikki: Yeah. So what if we say a pit bull dog is a certain appearance or specific characteristics and then we describe what that is. Janis: It doesn’t help us, because what that really means is that you’re no longer talking about a dog breed at all according to any meaning of the term. Because, remember, that’s a closed gene pool of dogs that are only allowed to mate with each other. So you’re not even talking about dogs that are genetically related. You’re just talking about characteristics. And you wind up talking about mixed breed dogs, as if they were all members of a single breed but they’re not. That’s you know the opposite of the definition of a breed. All you can possibly know by looking at two dogs and seeing that they resemble each other in appearance, is that they resemble each other in appearance. That’s all you know. You can’t know anything about what the rest of that dog’s genome, which is ninety nine point seventy five percent of the of the dog’s genome that is not appearance, you can’t know anything about that remaining ninety nine point seventy five percent. The huge preponderance that affects everything except their looks. So I mean, you can think of how hard it is to win the lottery. So, think of having two lottery tickets and they’ve got six numbers each (I know this because I play the lottery, in defiance of all logic) and the two tickets, they share one number and all the rest are different… and you magically have some kind of insider knowledge – we won’t say how you got this knowledge because most of the ways you could do that I think could land you in jail – But let’s say you have this knowledge that the next combination… the next jackpot is going to be a combination of the numbers in these two tickets. And at first you’re going to be really excited and think you’re a slam dunk to win the next drawing, but you still better have a whole lot of money. Because, if you start doing the calculations, you’re going to realize that there are still tens of thousands of possibilities and that’s only with a total of 12 numbers and 12 variables. Now think about the dog genome with 20,000 numbers from each parent, a total of 40,000 thrown into a pot, and you look at your two dogs who, even if they look identical, are only demonstrating that they’ve got an overlap on 50 out of those 20,000 numbers or one in 400. You pretty quickly realize that trying to predict what other stuff they might have in common in their genome is pretty much useless. Repeated studies show that people can’t agree about this. And multiple other studies show that people are just plain lousy at figuring out the ancestry of mixed breed dogs by looking at them to begin with. So that means you don’t even have a list of twenty thousand or forty thousand in your lottery pool to choose from. You have something like zero to infinity so appearance just doesn’t get you there. Regina: OK. But you know I think that for a lot of people just the general public I think they can grasp why scientists sense and everything so then use the term. I think they can probably understand everything you’re saying. But, for a lot of people it’s kind of a term of endearment for their dog. So if it doesn’t mean that much then what’s the harm in doing it and using the term. Janis: I would say mainly because it’s not a term of endearment for everybody. And so every time you use this term or one of the various euphemisms for it, like bully dog, you’re you’re granting… you’re tacitly affirming that this group actually exists and that we know what it consists of… that that it’s a group of animals that are both identifiable and in some way related. And we’ve seen that this just isn’t so. This means that any dog can be labeled this way by anybody who is so inclined. You can pretty much apply this label to any dog if you want to. There’s no way to demonstrate that a dog isn’t a member of a group if no one knows what the group is. This is the perfect condition for scapegoating and this is what’s happened to dogs who were labeled this way more often than not. It allows any and all bad encounters between dogs and people to be attributed to this group because it’s an undefined group. So it’s if something bad happened, it must have been it must have been a “pit bull” and then turn around and use the fictitious attribution the mistaken attribution to demonstrate the guilt of the members of the targeted group. So it’s a circular thing. And so, I think fondness for the term is and I can certainly understand that is trumped by the way that dogs have been and continue to be scapegoated by this term. It may well be the reason that the term “pit bull”… the label “pit bull” has lasted longer in kind of the general conventional wisdom than that of of of any of the previously vilified actual breeds, except possibly bloodhounds. And so I mean this isn’t this isn’t the first grouping of dogs or labeling of dogs that’s been that’s been used to to vilify a group. But it’s the one that stuck the longest, except for blood bloodhounds, which were the the earliest that I know of. But, they were given this label in the 19th century and at the time bloodhound was almost as loose a definition as “pit bull” because it occurred before there were you know breed registries that really defined what particular breeds work. But for Spitzs, who were considered horrible dogs for a while particularly in New York… for bloodhounds as they exist now… for German shepherd dogs… for doberman pinschers… all of these dogs have been called, you know, the scary breeds in popular perception, but they actually are breed. They actually exist as breed. So, that means that this demonization eventually could fade away in the face of reality. Since there is no real thing that corresponds to the term “pit bull,” that kind of failsafe that contrast to what’s real, doesn’t exist. So if if you decide you use this term you as a term of convenience to describe any group no matter how no matter how good your intentions, you’re actually inadvertently participating in this scapegoating tradition and keeping it alive. So, I think it’s fair to ask yourself if you feel you know kind of attached to that term, particularly if you’re somebody who’s going to be writing about this and talking about this in any public way… or reporting on identifying your dog in this way to anyone… you’ve got to ask yourself why are you so attached to using this term when it has such potential for harm. It’s time to let it go. Nikki: Yeah, I completely understand why scientists and journalists and any sort of animal expert should not be using the term “pit bull,” but I will say, honestly, I almost got a little bit emotional about people with pet dogs and them calling their pet dogs “pit bull” or whatever they want to call their dog. Pet owners should be able to call their dogs whatever they want. And I’ve said that a couple times and a few podcasts and I still agree with it in some sense. I had talked to Stacy and Regina about this a little bit last week, and after my talk with them I sort of really thought about it with myself and came to the realization that yes you can call your dog a “pit bull” if you want to…. and I think I was getting so emotional about it because I think that there shouldn’t be those consequences – but that’s not the world that we live in. That’s not the climate that we live in. So, if you call your dog a “pit bull” there are consequences and I think I get really emotional about it because I don’t think there should be those consequences. Does that make sense at all? Janis: Yes, yes. And you put the thing your finger on the issue there, which is there are consequences, even if for you it’s a it’s a term of endearment. You know, people are going to are going to call their dogs all kinds of pet terms. It’s when that becomes confused with reality that’s when there’s a problem. So let me give you a a a really unpleasant hypothetical: Let’s say that your dog, who you fondly refer to as a “pit bull,” some far fetched situation occurs and your dog bites somebody. Maybe it’s you, maybe somebody visiting you, maybe it’s a stranger. Maybe it’s completely accidental. But in the course of this, you know, person who’s bitten… and maybe it’s a little scratch… doesn’t know you or doesn’t know whether or not your dog was vaccinated and so goes to an emergency room. What do you want to have happen when the intake people at this emergency department, and they’re probably going to do it, ask that person or you what the breed of the dog is? Do you want them to say “pit bull”? There are consequences for using a term that isn’t real. That becomes one more penny on the scale of A) this is a group that exists and B) it’s a group that’s dangerous. So, is the fondness that you feel for the term important enough for that tradeoff? Regina: I want to clarify just because I know that some people are going to wonder this. Some people who don’t like us are going to wonder this… that you know there’s going to be that issue that we get a lot of times with removing breed labels as “well are you trying to hide what a dog is or lie about what it is” and I just want to clarify, which Janis you said several times throughout this that like German shepherds and bloodhounds and all these things and Spitz as they are real breeds. So you’re not saying hide what the dog is you’re saying just be accurate about what the dog is. And so if you don’t know say you don’t know and if you do know don’t call it a label that doesn’t exist. Janis: Exactly. I mean if you you know if you in that in the unlikely event in a shelter situation for example that you actually know that the dog is a pedigree dog of a particular breed I mean and and a person asks you you can tell them. That’s a fairly far-fetched scenario it doesn’t really happen in in shelter situations it happens in breed rescues. OK. So I have I have two greyhounds sleeping in my living room right now. And they came from a greyhound rescue. They have tattoos in their ears that that you know that that verify their pedigrees. Janis: It’s perfectly legitimate for me to say I have two Greyhounds. So if this this is about whether or not you’re saying anything real and when you’re not what harm it can do. 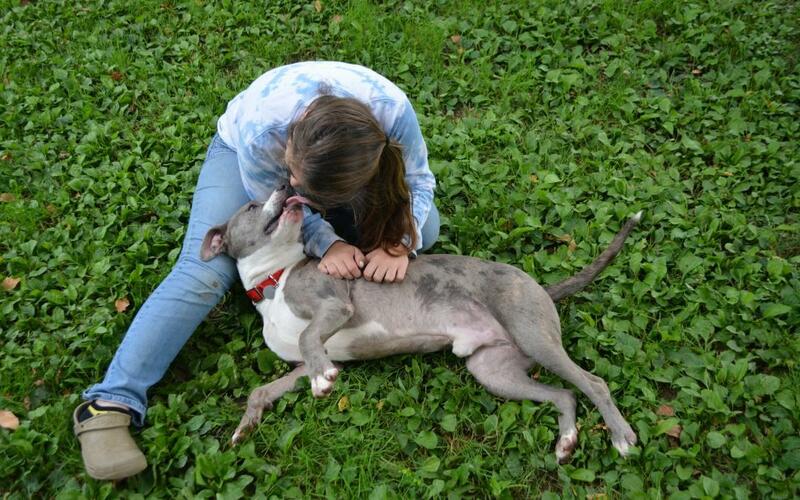 Nikki: Would you say the same thing for dogs that wouldn’t be labeled “pit bull” in a shelter? So dogs that wouldn’t be labeled a shepherd mix for a lab box or mix. The same sort of applies in those context as well, where you shouldn’t be calling those dogs such and such mixes because that’s not really a thing either. A boxer lab mix is not really a breed. Janis: And you’re very unlikely to know that anyway right. Yes. So. So a it’s going to be inaccurate. So you’re attaching an identification that probably isn’t true and B) that identification can then go on to carry assumptions about how the dog may behave which are completely unpredictable in any mixed breed dog and extremely limited usefulness in pedigree… but have zero predictive usefulness in terms of behavior in in mixed breed dog. So you’re giving a false impression. A) you’re giving a false impression that you know what the dog’s background is because you don’t and B) that’s actually that you’re telling them that because it’s somehow significant to what you know what kind of personality they can expect this dog to have which they can’t based on that so you’re misrepresenting the situation for this person in at least two ways. It’s really sort of, you know, deceptive advertising. Regina: Stacey did you want to chime in? Stacey: Well Janis, how do you feel about answering any questions like on a more philosophical level too because you certainly qualified to do that as well. It occurs to me that we are talking about pitbulls are not a breed pit bull is more like a unicorn. But we still just keep talking about the dog and not about the human need to have a label for it. And Nikki touched on it a little bit… but breed is a science term. There’s nothing that is gray about what breed is. Once it’s established, it’s very definitive. it’s defined and you know precisely what it is. As soon as a dog out crosses from that, we still have like the psychological need to label it something. And I don’t know… it seems like we’re missing an opportunity to talk about the psychology of the human need to label this dog and feel like when it tells us something about it. Because I got an email from Palm Beach County animal shelter because they want to do a 30 minute special one on their…. what’d they call them?… their square-headed dogs… because they somehow thought square-headed was better than blockhead was better than “pit bull”. And I remember when we first started finally making the progress on getting the attention of some of the larger groups that were really holding on to quote unquote “pit bull” especially some of the longtime well-known “pit bull” rescues, where they started calling them blockheads. Or then they started calling them short haired muscular mutts or something like that. I can’t remember what Best Friends called them for like 20 minutes. They came up with another thing that was just as inaccurate. But there’s gotta be… and I’m not articulating this very well… but there’s gotta be something we can say about the need, as humans, to be able to label something as if we know something. What does that confidence come from? …I can’t get…I’m so not explaining this very well! So what I’m gonna need to explain to the Palm Beach people is that the fact that they are… they think they’re describing a common physical attribute in these dogs is incorrect too. Because it’s all subjective. So what they think is square-headed, may not be what I think a square headed… which is just exactly the same thing you’re just replacing one with the other. And I don’t know do you feel like we’ve tackled that enough in this conversation? or is there anything, Janis, that you can sort of explain about human nature that draws us to this and makes us think that it’s correct? Janis: I mean I. I think Stacy I’m actually a bit more optimistic than you are about this. I think it’s possible for people to learn to say mixed breed you know with some with some satisfaction. I’ve had a couple of dogs that I that that I you know referred to that way and then and then use actual individual physical description. I mean, I think people have learned to do this to a much greater extent than they used to do, at least in polite conversation, with other human beings. I think I think we’ve really learned that it’s not appropriate to say you know describe a person to label a person by some sort of, you know, more full logically assumed ethnicity, for example, that we’re that we’re more comfortable with actually describing the you know the person’s physical and behavioral attributes you know for for that for that matter. We can talk about a person as tall or short or large or small or blond or dark or you know any any of those things. And we’ve grown comfortable with that. I think we can. 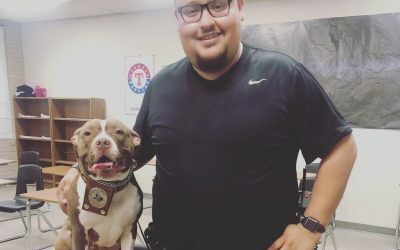 I think we can do the same things with dogs… that mixed breed you know and a description and sometimes a facetious you know description of a physical attributes that are that are individualized is possible for people to learn to do. So I’m a bit more optimistic is because as soon as you capitulates to any of these groupings, particularly this this fictional grouping, you open the door to stereotyping which is the complete enemy of any kind of improvement in human canine relationship. It just it puts a barrier of stereotype between the person and their ability to perceive that particular individual. For me I think this is a fight worth fighting…. That one morphological group shouldn’t shouldn’t have to have a fictional title among the mixed breed dogs in a shelter that another morphological group does have. I mean if if you can let go of shepherd mix, you know which people are now really letting go of. You can let go of people. It’s just it’s just a matter of of keeping insisting on it being important. Stacey: I guess what I’m trying to understand is the human element of it all is like how what is it about us humans that…. Regina: So I can…. so I’m going to pull way back on when I was starting my life and planning on being an academic so I’m going to pull on my philosophy and anthropology degrees and I think I can answer that for you. Labels make us feel comfortable. They help us identify the world. They help us identify ourselves and identify things that are outside of us. And in some ways, and Don touched on this in the podcast we did with him on social constructs, is that for people who have dogs labeled “pit bull” or dogs that they just perceive as “pit bulls,” they’re kind of reclaiming the term, because they feel like they’ve had to fight so hard to get their dogs considered acceptable by society that that for them it has almost they are reclaiming the term and it makes them feel better. And there is this whole thing with a lot of people especially those you know people who use the term pibble or bullies for them, that is saying their dog is special, right, which is the opposite of what we want them to do. But we all have a need to feel special and to feel like the things that we love or special. And so that’s that’s part of it. Now with the shelter I think that that just fits into people feeling like we need labels to identify stuff. It’s so hard for us to let go of identifying things as something different than just that almost it makes life easier for us in our little theory in our mind when in reality we’re actually making life more difficult. And to Janis’ point we have to keep making people aware of why the label not only isn’t important, but why it’s dangerous. So all we have to do is keep talking about it. Regina: I was just going to say that people don’t… labels are almost instinctual for us now. You know I study classical history too and I mean way back when even prehistory people had labels they label thing. So it’s so ingrained in our human nature that we don’t even think about about it we just do it. So we have to kind of unlearn that. We have to unlearn that habit. Janis: But mutt is a label too…. mixed breed is a label too that that can be that can be used either you know positively or pejoratively… but as far as I know I really think that as long as we’re applying these kind of falsified categories, he problem of victimization will not go away. The targets will just change. It just…. you know it will. It just becomes a continuous unwinnable fight. Somebody is going to be victimized as long as somebody can be can be identified as a as as a target because I would submit that scapegoating can be a more powerful piece of human nature then the simple urge to categorize. Because what it allows you to do is give yourself a false sense of safety. It’s not me and mine. It’s a “that.” And as long as we accept that way of looking at dogs and behavior there will always be an “other” that is not that that’s at fault. So. So it just has to be pushed back again. Janis: You know, I mean, it may not always be “pit bull.” So that could be it may not be always be that right. That could be you know the the ultimate effect of taking back that label but you haven’t solved the problem right. Regina: Well it’s just like when when people will say well I’ve been bitten by more X breed than “pit bulls” they’re just replacing it and they’re creating a new problem right. Janis: Yes. And those pejorative labels are extremely sticky even when they’ve faded for a long time. They’ve they’ve they’re they pop up again. I’ve just been you know talking talking with people who are dealing with you know a dog being vilified because it’s the Doberman and that’s a long time ago. You know since that was the new breed of choice but it’s still there just you know you give it an opening and it pops back. Stacey: So… OK… Question then though… We keep talking about labels and the labels that we’re talking about, especially with breed, and about how we label humans…. it’s all based on appearance not on like behavior observation. So we look at dogs we think we know what that dog looks like. We lump that dog into a category and then we make assumptions about how that dog will behave. So this, right, this cycle of discrimination is it always based on appearance or perception of appearance? And I guess that’s what I really want to stress is it’s perception of appearance because we don’t always perceive what we see the same or interpreted the same as the others around us. Is it but is it always based on appearance on we when we label and then discriminate? That’s all I can think of is that when we look at something, we put a label on it and then we make decisions about it based on our visual inspection. Janis: Well there’s another step in there. You visually identify something and then you associate it with whatever in your experience is positive or negative about it. And then you apply that perception to the next individual that meets that same appearance. So, you know, I mean there’s kind of this other step there. And of course that intermediate piece is gonna be different for different people though. So, in some cases it’s going to be positive. In some cases it’s going to be negative. I just started reading a really interesting study where they showed that they showed a bunch of people positive and negative pictures of German Shepherds and then they gave them a questionnaire to rate a bunch of different breeds according to various characteristics. And it had an immediate and dramatic and lasting effect on those people. Just looking at a picture or in some cases that people would read a would would read on a news story and depending upon whether whether that stimulus was was scary or friendly seeming affected their responses on a kind of a questionnaire rating various breeds as far as their temperament. So you’ve got to remember that everybody’s got their own experience all in there. And in some cases, the almost culture wide experience. You know, the kind of media experience… what the received wisdom is… negative and in other cases, it’s mostly positive. So that’s where you get your kind of culture wide stereotype. It’s still a matter of what you’ve heard, what you’ve seen, what you’ve been told, or even more powerful what more powerfully what you have directly experienced yourself. And then you attach that experience to the next entity that comes across the screen of your life that resembles the one that you derived your experience. Stacey: So in the case of when we talk about Pitbull and we mean it in an endearing way… So like for all of us on the call we don’t have that negative connection to the phrase pit bull, because we’ve all overcome or resisted or whatever that whatever that fear influences of that we were taught to to assume from the media or from whatever…. Janis: I don’t think that’s what’s happened. I think what’s happened to us is that we’ve had a large enough accumulation of pleasant experiences that that becomes…. Janis: I think it’s the rare person. Yeah I agree. I think it’s the rare person who uses the term with the awareness that it doesn’t actually mean anything. Whether their association is positive or negative. Stacey: So what about then when we see research that uses the term pitfall in it. So this is something that we’ve talked about before Janis. But when we see research studies come through, whether it’s in a medical journal or a veterinary journal or a behavior journal, what does that tell us about the research if they’re using the phrase “pit bull” in it? Janis: I mean there are two possibilities and I think both of these both of these happened depending upon depending on on the particular researchers. Sometimes it means that the researcher really is so ignorant about dogs that they don’t know that there is no such breed and that the term doesn’t mean anything OK. And I mean that’s something that theoretically at least can be corrected. You know understand that you’ve said something and you might as well as that blah blah blah. Because it isn’t it isn’t real. But the other the the other thing that I think happens with with people who do know that this is an empty construct that is purely a social construct with no actual real life members in the category, seem to feel the need to use it as a term of convenience. I guess as a way to try and say identify a group of dogs even that they think may be being discriminated against but the effect of that is to, regardless again of the intention, reinforce the reality of the time. So, it reinforces that practice. It gives that strong give strength back to that practice of the emergency department person taking that that identification in as a real thing in the intake of somebody who’s who comes in with an injury. It strengthens the idea that the data that result from that is actual real data and not the garbage data that we know it to be. Stacey: Can you… you mentioned social construct and your answer can you give us other examples of what a social construct is so that we can relate it to other things so that we can understand it better? Janis: Some things that we think of as part of the definition of a social construct is something that has that has a wide variety of definitions without any real agreement. You know, the concept of deviance, for example, is very, very relative. And it’s society specific. it’s culture specific. That’s an example of a social construct. But, you can think of, even when you’re talking about real breeds, the perception of those of those breeds is clearly socially constructed. And I can give you one example, because it’s because it’s one that that affects my life sort of theoretically, a little bit. The breeds of dogs that are that are generally kind of thought of or legislated against as dangerous varies broadly among cultures. So, you know, the hypothetical category of “pit bulls” is probably the most common label that’s used in this country. The top scary breed in Northern Ireland and Australia is greyhound, where the where the conventional wisdom is you let them loose and they’ll kill your small children and small pets – which is shocking to people here because it’s completely different from the perception here. So, you can think of it as a kind of a perception of something… the definition of which has no agreement. It varies from culture to culture, from subculture to subculture, sometimes from person to person. So there’s no real possibility for human communication if you don’t agree or if you can’t agree on what the words you’re using mean. And that’s definitely the case with this particular [inaudible]. There’s no agreement as to what it means. So, you can have the impression that you’re actually communicating with someone, but in fact, when when you say blue they’re thinking you mean green. It’s really that kind of a gap. And it doesn’t matter how you change the words that you use. You know there’s no more agreement if you stay blockhead, for example, than if you say “pit bull.” You still don’t have any two people who necessarily agree on what you mean. But you can’t talk about it in an intelligible way. Stacey: Right. I’m glad you got to that because it’s kind of where I was going with bringing up the example that some people come up with what they feel like is a more endearing phrase to describe the same unidentified, undefinable group. Janis: That doesn’t make it real. Stacey: It doesn’t make it real. So this… is breed in and of itself a social construct? Janis: No I would say not. As long as we agree on up on a specific definition, which we pretty much do now. No, I mean it’s something that’s been created by human beings for whatever reasons – and we can debate that forever – but a closed gene pool is a real thing. Stacey: But it was purposely constructed by humans…. Janis: It was. It absolutely was constructed by. By humans. But not, you know, not necessarily socially constructed in the sense of a thing that only exists on a conceptual level. A building is constructed by humans too. But it’s not a social construct. Stacey: I feel like this is. This discussion has gone pretty well I think. I think it’ll be yes turning into a good resource to refer back to. Nikki: I agree. And I also think that people will still have a lot of questions because it is definitely something that’s hard to wrap your head around. So if anybody has any questions I know I personally would love to hear from people and see what we can add to this conversation and maybe record another podcast at a later date to sort of to add on to what we’ve already talked about. And to answer some viewer question… listener question. Regina: Yeah I agree. I believe we would love to do a question and answer so if you have questions please send the men or comment on Facebook because it would be really excellent if we can answer questions from people. Nikki: All right well Janis thank you so much for coming on our podcast. We were really excited to have you. Janis: You’re most welcome. This has been an interesting conversation.